La Belle Verte or The Green Beautiful / Visit To A Green Planet as it's alternatively known in English is a brilliant movie written and directed by Coline Serreau released in 1996. 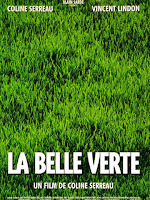 La Belle Verte is a philosophical, anti-conformist, ecological, feminist, humanist and pacifist fable filled with humour. Somewhere in the universe, there exists a planet where the inhabitants have evolved and live their lives in perfect harmony with nature. From time to time, some of them leave to visit other planets. Watch the interviews, trailers and behind the scenes of Biutiful Movie and many more videos.